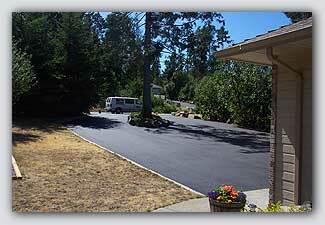 When considering a driveway , parking lot or RV space there are many issues to review. The following list may help you review these issues. The constant need to remove weeds and treat the area with herbicides. To improve the curb appeal and bring added value to property. Problems with puddles, deep ruts and potholes throughout driveway and parking area. Constantly regrading the driveway to remove bumps. Seasonal maintenance herbicide in the spring ;weed pulling in the summer; carwash puddles in the fall and difficultly shovel snow with gravel underneath. The wear on floors and carpets with the grit from gravel driveways entering in the house. More usable yard space for families. Need a quote from us?